§ 402.080 Residential Zoning Districts ("R-1" Through "R-5") and Residential Uses Within The Mixed-Use Traditional Development District. § 402.090 Commercial Zoning Districts ("C-O" Through "C-3"). § 402.100 Industrial Zoning Districts ("I-1" and "I-2"). § 402.110 Tree Standards Along A Roadway. § 402.120 County or State Right-Of-Way. § 402.130 Tree Location Standards. § 402.140 Recommended Planting Standards. Section 402.080 Residential Zoning Districts ("R-1" Through "R-5") and Residential Uses Within The Mixed-Use Traditional Development District. Section 402.090 Commercial Zoning Districts ("C-O" Through "C-3"). Section 402.100 Industrial Zoning Districts ("I-1" and "I-2"). Section 402.110 Tree Standards Along A Roadway. Section 402.120 County or State Right-Of-Way. Section 402.130 Tree Location Standards. Section 402.140 Recommended Planting Standards. Where record plats have been approved in a subdivision prior to November 1, 2001 without an approved landscape plan, said plat shall conform with the ordinance requirements in place at the time of approval which typically required the installation of one (1) tree per fifty (50) feet, or portion thereof of street frontage, public or private, within an area between the front of a structure and the curb. Said trees can be clustered or arranged within the setback and need not be placed evenly at fifty (50) foot intervals. For residential subdivisions approved between November 1, 2001 and the adoption of this Article there shall be a minimum of one (1) tree for every lot; in cases of lots having frontage on more than one (1) street (e.g., corner lots, through-lots), there shall be a minimum of one (1) tree for each street on which the lot has frontage, unless the developer and/or homeowners association has established a landscaped buffer along the street frontage. Each tree shall be at least two (2) inches in caliper at planting and must meet the definition of a "tree" at maturity. Prior to the adoption of this Article, City codes had allowed trees on lots to be placed within the City right-of-way, specifically between the sidewalk and back of curb. It has been observed that this has caused damage to City and private infrastructure as well as sight-distance issues, safety issues and property damage. 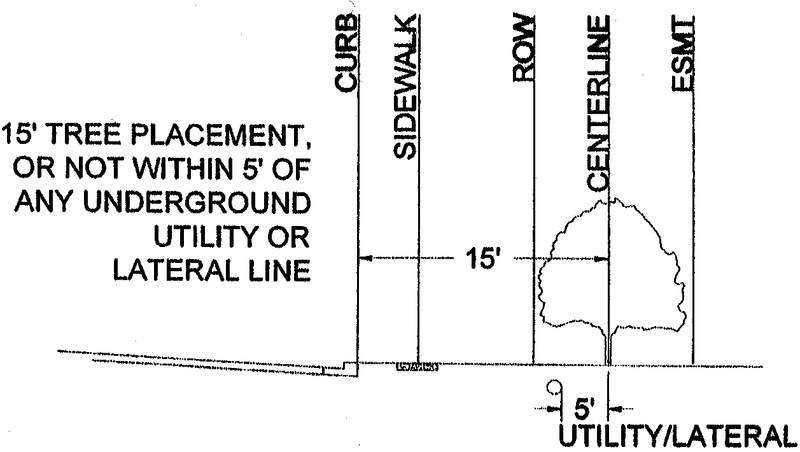 Unless otherwise provided by this Code, trees will no longer be located within fifteen (15) feet from back of curb. 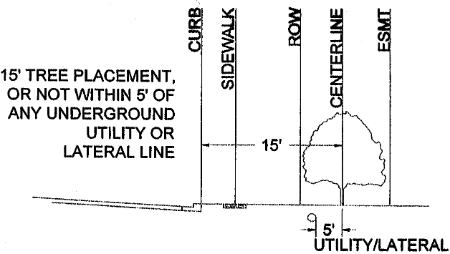 City codes still require one (1) tree to be located within each lot and two (2) trees if located on a corner lot. One (1) tree for every forty (40) feet, or portion thereof, of street frontage, public or private, shall be required within the landscape setback abutting said street frontage (as determined by the type of roadway). Said trees may be clustered or arranged within the setback and need not be placed evenly at forty (40) foot intervals. In addition to the required trees, based upon street frontage, one (1) tree shall also be required for every three thousand (3,000) square feet of landscaped open space. These may include the trees required in parking lots as set out in this Chapter. Trees along the roadway shall conform to the tree standards set forth elsewhere in this Chapter. One (1) tree for every forty (40) feet (or portion thereof) of street frontage, public or private, shall be required within the landscape setback (as determined by the type of roadway) and need not be placed evenly at forty (40) foot intervals. In addition to the required trees, based upon street frontage, one (1) tree shall be required for every four thousand (4,000) square feet of landscaped open space. These trees may include trees required in parking lots as set out in this Chapter. Trees along the roadway shall conform to the tree standards set forth elsewhere in this Chapter. One (1) tree shall be located in the front yard of every lot, unless on a corner lot in which case a tree shall be located on the frontage of each side as required per the zoning district. No trees are to be located within the right-of-way, following the standards set forth in this Chapter. Unless otherwise approved as part of a development plan, trees are to be no closer than fifteen (15) feet to the back of curb and not within five (5) feet of an underground utility or lateral line. Collector And Minor Arterial Road. One (1) tree for every fifty (50) linear feet as required per the zoning district. Trees shall not be located within City right-of-way unless a landscaping plan is reviewed and approved by the City. If a tree is located within City right-of-way or within fifteen (15) feet to the back of the curb, it must be an acceptable species as outlined in the tree list and not within a ten (10) foot easement. Medians For Collector And Minor Arterial Roads. Median must be a minimum of seven (7) feet in width. If trees are planted in the median, the tree spacing will be based on the type and size of tree or shrub. No trees shall be located within twenty-five (25) feet of the median tip or within the intersection line of sight, whichever is greater. No trees shall block the line of sight for a traffic signal. Tree must be an acceptable species as outlined in this Chapter. If the median is wider than seven (7) feet, additional tree species may be approved by the City. The median shall be served by automated irrigation. The minimum soil depth shall be provided to accommodate the trees proposed. Turf areas to be finish graded in a manner that eliminates mower scalping. Permanent subsurface drainage that collects and removes gravitational water from the pavement and root zone area eliminating seepage to the road surface. Tree planting in roadway/median landscapes. If the landscape planting is to support tree growth above eight (8) feet in height, the root zone supporting the landscape plantings must be excavated below pavement grade to a point below that interfaces the root zone mix with the soil below the road bed. Pavement, concrete rubble, gravel, etc., that restricts or limits root growth is prohibited from the root zone area. Sight Triangle And Obstruction. On the point of any access onto a public street or the intersection of any two (2) streets, development shall conform to the requirements of the sight triangle in which nothing shall be erected, placed, planted, or allowed to grow in such a manner as to materially impede vision between a height of thirty-six (36) inches and fifteen (15) feet above the grade at the back of the curb of the intersecting streets, within the triangular area formed by the right-of-way lines and a line connecting them at points twenty-five (25) feet from their point of intersection or at equivalent points on private streets or as otherwise shown on the approved site plan. The necessary agency must be contacted for their review of any trees to be located within their right-of-way. If acceptable, the trees must meet the minimum requirements and tree type set forth in this Chapter. Trees shall not be placed within twenty-five (25) feet of any street light or within fifteen (15) feet of the back of curb unless otherwise provided in this Code. Trees shall not be placed within twenty-five (25) feet of traffic control or street signs or within fifteen (15) feet of the back of curb unless otherwise provided in this Code. Trees shall not be planted within ten (10) feet of street stormwater inlets or manholes. All new trees within the City right-of-way must be an acceptable species as outlined in this Chapter. All other trees to be installed are recommended, not required, to follow the recommended species list outlined in this Chapter. Recommended (not required) tree species are outlined in this Chapter. It is not recommended to have a tree located within an easement since it could be removed in the future with no replacement costs provided. Tree location standards as provided in this Chapter shall be followed. Plant Material Selection, Handling, Inspection, Storage And Planting. Only desirable, long-lived trees of good appearance shall be planted on public sites. All trees shall have reasonably straight trunks with well developed leaders and tops. All plant material should be free from insects, diseases, wounds, and cankers. Trees planted shall be adaptable to USDA Zone 5 climate conditions. There must be a well developed root system and root ball must be moist. Root balls must be protected from freezing. Trees should not be picked up by their trunk. The soil ball should be supported when moving the tree. Trees should be protected during transport and kept cool and moist at all times. All trees must adhere to the Standards for Nursery Stock. The City has the ability to reject any and all nursery stock. Tree Planting. Missouri law requires that a locate request be placed before beginning any excavation. Place a locate request by calling 1-800-DIG-RITE (800-344-7483). The utilities should respond to your request and mark the approximate location of their facilities within three (3) working days. You can then proceed with your excavation avoiding damages. Planting Procedures For Potted Or Balled And Burlapped Trees. Optimal time for planting trees is the fall or early spring, when the tree is dormant. Planting trees at other times is discouraged due to increased stress on the tree. If you have any questions on planting times contact the O'Fallon Parks and Recreation Department. The hole should be dug with the width three (3) times the spread of the root ball no deeper than the root ball. Holes should have slanted sides and be roughed with a shovel. Trees will be planted no deeper than the original root flare. Do not confuse a graft union for the root flare. In clay soils trees can be planted slightly high. Excavation and soil replacement may be necessary where there is overlay compacted subsoil and excessive amounts of gravel. Remove tree from pot or cut away twine or rope from stem and wire basket below ground level. When possible, roll back burlap from top and cut off top one-third (1/3) of the wire basket. Always remove all plastic twine and artificial burlap. Straighten tree and completely backfill hole with existing soil. Avoid using excessive amounts of organic matter. Apply water to settle the soil and eliminate any voids. At this time a solution of root stimulator (not fertilizer) can be watered in. Chop up any dirt clods; add soil if needed. Place a two (2) to four (4) inch layer of mulch around the tree in a minimum three (3) foot radius. Make sure that the mulch is not mounded against the base of the tree trunk.